How to mount the VALVE? IZI-flow (easy-flow) is easily connected between the angle valve and the faucet, by simply mounting it along the water line. A stand-alone Mouse-Pedal or a Base-Plate Pedal, mechanically activates the hands-free tap. 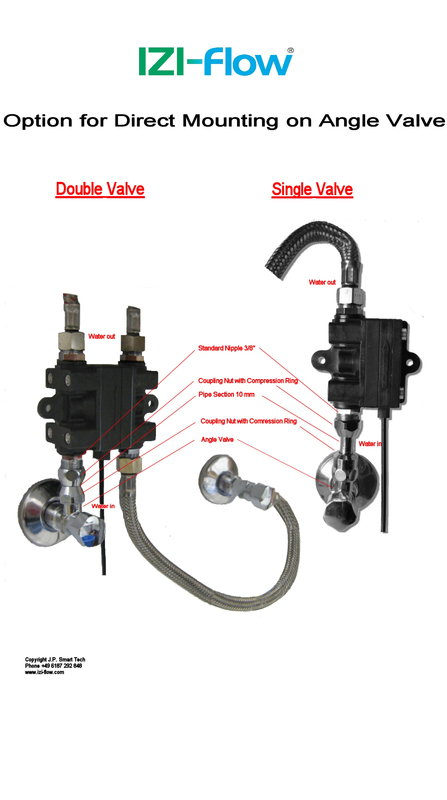 The IZI-flow® valve is fixed to the wall bysupplied fittings.However, even without fixing, the valve is functionally reliable. 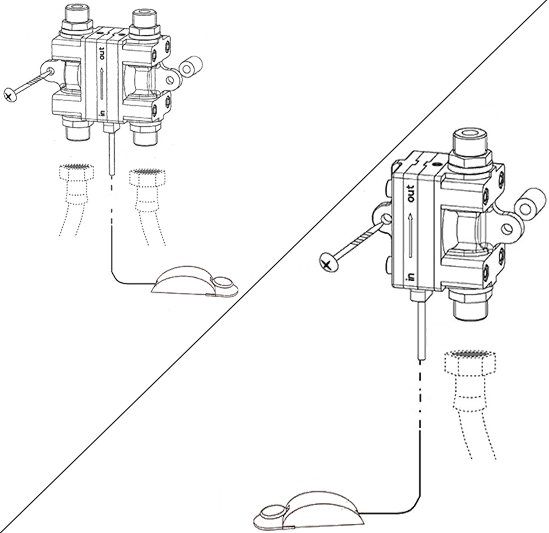 The important parameters to consider are the water flow direction assuring and to secure that the cable is properly inserted into the body of the valve (inside the bore opening). 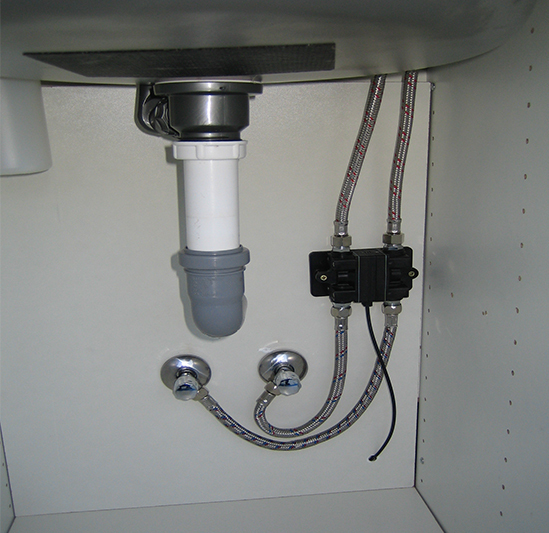 Alternatively, you can install the IZI-flow directly on the angle valve. Here you have to use a ‘Mounting-Kit’ that can be purchased from us, or at any Home-Depot (DIY). 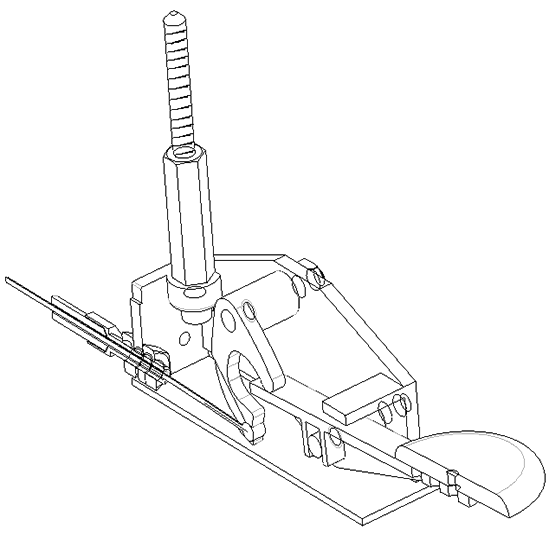 How to install the Base-Plate PEDAL? The activation of the base-plate(kick-board) pedal is remarkably elegant. The pedal mechanism is located behind the kickboard on the floor - tilt-resistant when fixed to the bottom of the cabinet. The strengthening of it is not dependent on the front plate, because it isfixed to the massive cabinet. According to the wall thickness of the panel, several options exist to screw the stainless steel disc to the lever.